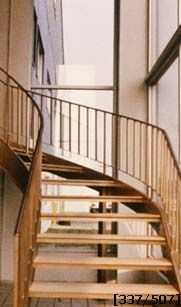 Stairways, Inc. has produced spiral staircases for many types of applications with Trade Shows being one of these. Spiral stairs, curved staircases and straight stairs all have to be used when a two story trade show booth is erected. Compliance with fire codes has to be met for these applications. Structurally, these stairs could be fully loaded. Appearance: a spiral stair or any stair used has to match the overall feel of the booth. Trade show stairs generally lead to a more intimate area of the booth and many times where the "big deal" is done. A potential customer needs to feel safe and comfortable on the way up. In this photo of a curved stair, one of the two has been designed and fabricated with transportation and field assembly in mind. Stairways, Inc. designed these stairs in three sections, all bolted. Columns supported each section for a freestanding structure, and the top is bolted to the second floor. Booth staircases can be offloaded from the trailer and installed in less than a day. The stainless steel railing and colors blended with the surroundings which made these staircases a show stopper.